The lack of Christmas Newsletter must have told you that my life has been more than complicated. It is the first time in years I have been so ‘off deadline’ but right up until the last minute I didn’t know if Roger was even going to make the Canadian Christmas tour. I apologise to all who have written, and all of you who usually follow the sagas of the Whittaker’s! Family news has not been that great these last few months – more about that later. In October our beloved but overly boisterous bulldog Boris, decided to rush upstairs ahead of Roger, entangled himself in Roger’s legs, causing him to fall backwards into the edge of the window sill on the landing. At first we just thought he was bruised, and minor cracking of one rib, but as the weeks progressed and the pain persisted, it was obvious it was more. More X-Rays revealed 3 broken ribs, and bruising to a lung! If he had flown to Germany to record as planned for early November the lung would have collapsed….Only one week before the tour was supposed to start he still hadn’t been given to OK to fly. At the last minute the thoracic specialist gave him permission to go ahead. But he is, still, all the months on, experiencing pain. The celebrations and ‘specials’ attached to this wonderful event are huge! 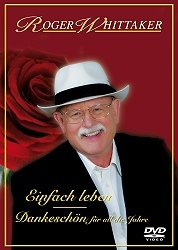 Since the early new year ARD TV have been planning the filming of a 90 Minute special entitled "EINFACH LEBEN – ROGER WHITTAKER 70 Gerburtstag" (a musical and biographical film, documenting his career, with live music , old TV appearances, stills and film of the family etc. ),which will be aired the day after his real birthday at 20.15 CET. Then on the 25th Roger will be the star guest on "Fruhlingfest der Volksmusik" , aired at the same time 20.15 – that is ‘live’ so anything can happen! So any viewers in Germany, Austria, Switzerland and parts of Denmark and Holland who can patch in to ARD will be able to catch both these shows. "EINFACHT LEBEN – DANKESCHON FUR ALLE DIE JAHRE" and as the title says "Thank you for all the years"! But this is not all - there are many magazine interviews and Roger is recording a special interview in London the day before his birthday on how he has been part of the music scene now for some 45 years! Then throughout the Spring he has several other appearances in April, May, July in Germany and Austria which I will place in "Appearances" box on the opening page of the web site. But JUNE we will be doing nothing but glueing our eyes to the World Cup, playing golf and fishing. When I say we, I actually mean Roger, as I will be busy organising our new, and very much smaller house 4 miles away. This house officially goes on the market in late April, and although we will be really sad to leave it after all the work on the house and garden, age is definitely catching up with us, and I, personally, creaking with arthritis and anticipating joint replacement surgery once we have moved, cant cope with the garden or general running of this beautiful but huge place. When we started the rebuilding we were 6 years younger and never anticipated how big the finished house would be! It would have been perfect 20 years ago with all the kids in it, but now we only live in a third of the house, except when the family pay their holiday visits. The children are actually delighted we are doing this, as they could see it was wearing me out. Where we are moving to there are several great B & Bs and holiday cottages very near by, so they can spend all the days with use, but the lack of bedrooms in the house wont be a problem! And I will only have 1 acre of garden, instead of 10, to care for. However the new house has wonderful outbuildings with a two part area that will make an even better studio space that we presently have and Roger has already written the first 9 songs for a new English album, which he hopes will be out in 2007. Having said all this, Roger has finally made up his mind that the 2007 extensive tour of Germany will be the last such tour, as he says "It is not the concerts that are exhausting, but the travel" He will never say he is ‘retiring’ again, as he may do occasional concerts from time to time, but at 70 he feels he wants to spend as much time at home and concentrate on writing, if not for himself, as other younger artists. So next week, on the 22nd, family, extended family and friends will be wining and dining with us to celebrate this milestone birthday. How about you all contact your local radio stations and tell them it is the great 70 - and declare it ROGER WHITTAKER DAY!!!! And get them to play your favourite songs! As I intimated at the start of this letter, Family life has not been the usual laughter filled months. Very sadly Lauren and Doc have decided to divorce, with all the pain and disruption, to the children especially, and on top of everything Lauren broke a leg very badly, requiring surgery, pins etc., and is having a hard time getting around. Rebecca has been an enormous help with the little ones, and even Imogen and Alistair have learned to rush around collecting up laundry etc. so Mum doesn’t have to climb stairs all the time. Poor Emily and Stewart had a few hard months, with Stewart being quite ill , but now well on the way to recovery. Alex found a job with a design firm but would like to spend more time painting as he has been offered a couple of exhibitions – I am taking him to Berlin for his birthday as there are some incredible exhibitions on there during the Spring. Jessica is finishing her book, doing her voiceovers and travelling back and forth doing her TV magazine show. She is full of the joys of life and thoroughly enjoying her beautiful apartment. Guy and Mette find themselves in the position that Roger and I were in all those years ago!...The band sees their first album released in April, and now he is spending all his free time doing ‘promotion’ while not ‘giving up the day job’ yet! Mette and I talk a lot and I am giving her the ‘showbiz widow’ advice as it really is hard to deal with. She is really supportive of his music career and is a great wife, but having your husband rush around the world is not the easiest. You don’t want to tell them of the terrible day you have with broken down washing machines, yelling children etc., and it can be very lonely from that point of view. The whole lot will be here in the summer and we are looking forward to the raucous shouts of children again – I am not sure the dogs will view the noise the same way, but Boris can certainly match the energy of Milo and Alistair. So, I must stop here, and wish all the best and our huge thanks to Jesse (for the web site) Vicky and Rory and Anthony Mann for helping out with all the questions, and above all YOU, old and new friends who have been there for us, through thick and thin and I hope many of you from around the world will join Roger for his last huge concert tour in Germany, and Austria, (albeit much of it in German) and make a holiday of seeing the wonderful sights and cities. Don’t forget the Tsunami fund. .the whole area still needs so much doing to it, and the children, especially those orphaned, will need ongoing help for many years to come. Many people have asked what Roger wants for his Birthday, and his reply is "send whatever you can to the Minor Tsunami Recovery Foundation….the smiles are slowly coming back"
I will be in touch soon, but after letting you down so badly over the Christmas period, I wont promise when, but the web site will be updated with appearances etc., regularly.